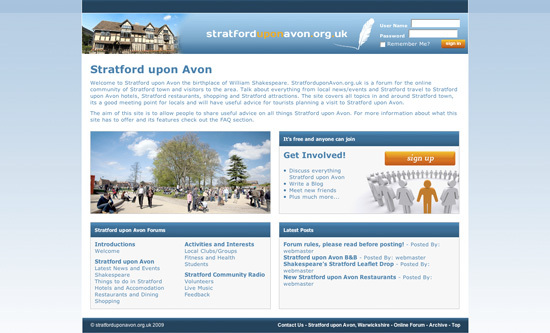 www.stratforduponavon.org.uk is a forum for the online community of Stratford upon Avon and visitors to the area. Talk about everything from local news/events and Stratford travel to Stratford upon Avon hotels, Stratford restaurants, shopping and Stratford attractions. The site covers all topics in and around Stratford town, its a good meeting point for locals and will have useful advice for tourists planning a visit to Stratford upon Avon. The site also features a specific area for Stratford Community Radio where listeners can post feedback on shows, ask questions and communicate with presenters. I will be on the radio on friday and will develop a political show!